A warm and windy night marks our first evening on Shishapangma. At 4,800m it had the potential to be a restless evening as altitude-fuelled dreams transition the mind between varying degrees of consciousness throughout the long cold evening – the first of many in my tent. We arrived yesterday afternoon to Chinese Base Camp in wild and windy conditions, the mountain obscured by a thick blanket of snow, cloud and spindrift. Shishapangma was clearly not yet ready to reveal herself and waiting for the right moment to make her entrance. What an absolutely stunning mountain – even more grandiose, imposing and almost ‘magical’ than pictures had revealed – particularly under the blanket of snow. 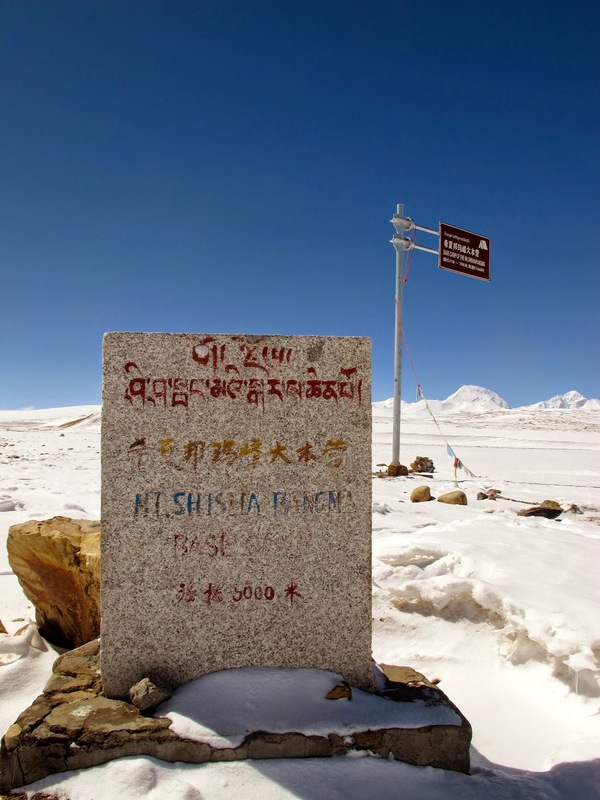 Shishapangma stands solitary, proud and elegant high above the Tibetan plateau, the snow-covered foothills rolling out from her flanks like long waves of ribbons, extending all the way to our little temporary Base Camp. As if to remind us of her power, a thin plume of spindrift wafts from her 8025m summit. Strong summit winds – something Shishapangma is notorious for and has thwarted many a summit attempt. Three large seracs are visible – covered in snow they almost look like eyes gouged into the mountain face. A broad white path can be seen crossing from left to right across the lower flank of the mountain, then veering gradually and gently back left and up, the final ‘trail’ veering steeply up onto a snow loaded summit ridge. This looks like the obvious path but it’s heavily crevassed, seraced and snow-loaded. The less obvious path is hidden behind a lesser mountain which fronts Shishapangma. It’s behind this mountain and from here that the traverse from Base Camp – Advanced Base Camp - Camp 1 – Camp 2 is made and then the climb up through a short couloir to Camp 3. I can feel myself relax – the mountain doesn’t look threatening... Rather, it seems to beckon, from across the dusty dry and barren Tibetan plateau. It has the presence and notoriety of an 8000m peak but the grandeur which will no doubt continue to draw myself and countless others to explore her lofty heights. With a quiet smile and without a shadow of a doubt, I feel quietly confident that I’ll be learning a lot more about the secrets Shishapangma has to share over the coming 3-4 weeks.